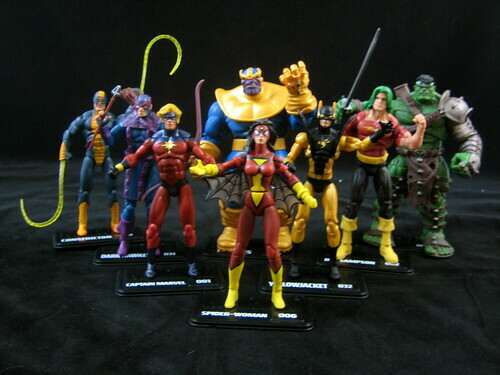 Despite its stop-start failings with the 6” Marvel Legends line, Hasbro has done a very admirable job of keeping it’s 3 ¾’ Marvel Universe line alive and well, and the latest Wave I’ve received, Wave 12, is a great example of how good this line can be. Dark Hawkeye is the figure I’m least fond of here, and I have to say had I registered that this was the Bullseye version and not Clint Barton (note to self – read what you’re ordering) I would have passed on this flash-in-the-pan variant. The figure is actually nicely detailed and includes a maniacal sneer just to make sure you know it’s not really Hawkeye, but these types of figures are generally easy passes for me. 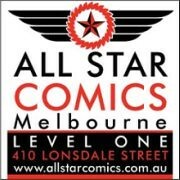 Doc Samson is on the next lowest rung of the ladder for some simple reason – his blank facial expression. Muscled guys with green hair can’t pull off that look without some ‘tude, y’know what I’m sayin’? Also, the guy’s supposed to be a genius, so why does he look the opposite? It’s still a fine figure – the muscled sculpt its great and paint is excellent – but this little detail bothers me. Hasbro continues to make the most out of its Hulk buck by including World War Hulk in this wave. This is one of the better Hulks in the MU series and sports a completely different headsculpt from other Hulks, which, combined with his well-produced armor and accessories, makes him feel like a separate character worth purchasing as opposed to some of the repaints which dot this line. Having very recently become a Hulk fan, I wasn’t tempted to pass on this like I am many of the Iron Man / Spider-Man / Wolverine variants. Yellowjacket is a welcome inclusion to the line. We now await Ant-Man in this scale to cover all of his most classic incarnations! One detractor here is that his antennae are a tad long and overwhelm the headsculpt ever so slightly, creating the impression that Hank’s is a bit too small. On the positive side, the paint work is excellent, with a slightly gold metallic paint used to deal with the challenging yellow areas of his costume. He also appears to have been done with a slightly more slender buck than some of the other males, which is very fitting to the character. Spider-Woman has turned out to be one the better females in the MU line. The female figures have often suffered from particularly bad headsculpts, or deformities like the hunchbacked Jean Grey (sob!). The larger detail on Spider-Woman’s mask probably helps in this instance. It’s definitely one of the better MU female heads. I’d love to see some small improvements on the MU female buck. I still maintain that the breasts on the females are just a tad too big – they stand out and distract the eye, and not in a good way, because they look more like two marbles stuck on to a figure than actual body parts. The join at the hips is also rather noticeable on this figure. The female buck really does need a bit of work to bring it up to the same level as the male. I’ve seen a few customs of Constrictor, and I have to say I’ve seen people do the lines on his costume by hand just as well if not better than what’s been produced here. This is still a great figure, and a character that is begging for release in the 6” scale. What I particularly like about Hasbro’s Constrictor is that his whips are embedded into his wrists, so they’re in no danger of getting lost or coming loose like some attachments and accessories. He also has a suitable villainous sneer which gives the figure a bit more character. Captain Marvel has turned out to be my second favourite figure in this wave, for the simple reason that his headsculpt is so successful. This is the main area where figures at this scale fall down for me, but Mar-Vell’s is spot on. Additionally, the red on his costume has been done without a noticeable wash, which can often make red look dirty and ruin red paint. A definite winner, and again, we need a 6” version that lives up to this. The unsurprising winner for me, though, is Thanos. It’s not just because of the scale, which is pretty much perfect compared to the other characters. The sculpting on this piece is brilliant – the details on his costume are very well done, and it’s topped off by an outstanding headsculpt for this or any scale. He comes with a swap out hand so that he can be displayed with either regular gloves or the Infinity Gauntlet, which is a brilliant piece in itself. A definite winner on all counts! I really like what Hasbro has done with the varying sizes of the figures at this scale. It’s made it possible to see quite a range of characters presented fairly accurately. Again, I’d just like to see a little bit of improvement to the female buck so that the ladies can match the gents! 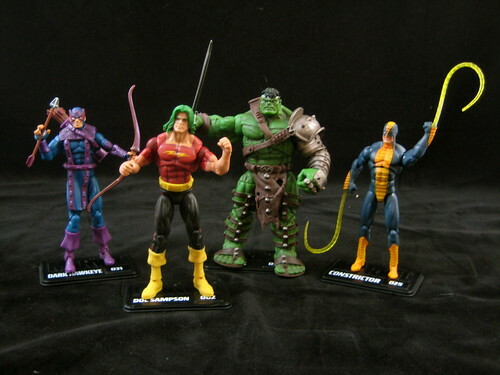 It's a great set to be sure, though I had Constrictor as my number two, followed by YJ and Spider-woman. And I'm pretty sure we got an Antman in that scale (in fact my cabinet says so - I just can't remember with who), and we get another one in the Classic Avengers box set later this year. I hope to find Spider-Woman at some point. WW Hulk is pretty awesome! I'm trying to find Thanos. I hope I don't need to resort to the secondary market for him! i love these guys. but i cannot seem to get my hands on a THANOS!! aarggh! Where's Spider-Man? And Wolvie? Crap set without the Bathroom Iron Man we were promised. 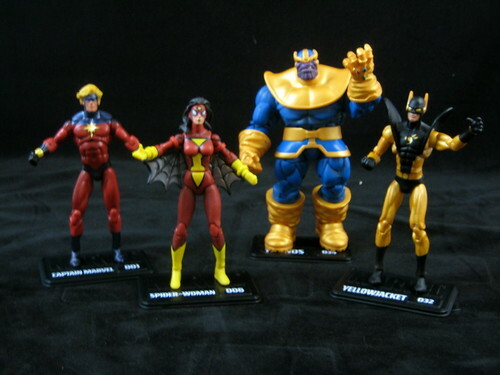 I'm hoping to find a few of these myself, I'd like Spider-Woman and World War Hulk, and I wouldn't say no to Thanos either. Also, he's a large figure with a bunch of acessories! And thigh cuts, thigh cuts FTW!! !